Safety/Quality Approvals: Specifications 1'Most competitive price 2'High quality 3'CE and ISO9001-2000 Certificate We provide high quality products and promise 1 year guarantee.We all do our best to Satisfy customers. We stick to the principle of"Quality and the prestige first,science and technology to seek development", and sincerely serve the society. Superior in geographic position, Qingdao Xiangjie rubber machinery company is located in west coast of Qingdao about Qingdao economic and technology development zone. 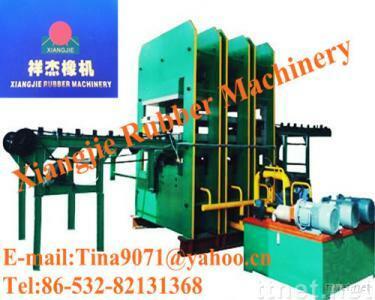 It is the one of the most famous rubber machinery manufacturers of China. The general manager Mr .Chai is one of the best engineers specially in hydraulic dynamics for more than 20 years. The company has a long and intimate cooperation with the professors in the Qingdao science and technology university, and has established a institution engaged in rubber machinery research and development.